2017 is a special year for Canada because it marks their 150th anniversary as a country. In honor of this centennial birthday, entry to all of Canada’s national parks is free of charge. When we first started making plans for full-time travel, our sights were set on faraway destinations that did not include our neighbor to the north. However, when we found out about the National Parks, we began to seriously consider making Canada the first stop on our trip. Thus far, that decision has proven to be a good one! Not only does it mean free entry to some of Canada’s most beautiful places, but we’re also close enough for friends and family to follow through with their plans to visit! Sure enough, just over one month into our travels, we found ourselves on the way to Calgary International Airport to pick up our adventurous friends from Colorado, DJ and Ching. Excitement was an understatement. You’d think one month wouldn’t be enough time to miss anyone but the closer we got to the airport, the more excited we were to welcome our first visitors and see their familiar faces from home! For this part of the trip, we’d planned a bit ahead (shocker) and padded their arrival so we wouldn’t have to do the full 12-hour drive from coastal BC to Calgary in one day. This left us with one night to camp and our brief research led us to a site just outside of Golden, BC, about 3 hours from Calgary. The campsite was on the border of Yoho National Park and overlooked the stunning Wapta Falls. As soon as we pulled up, we were awestruck by the view. If you follow us on Instagram, you probably were too. It was the most stunning view we’d ever seen, and yes, this picture is 100% real! DJ and Ching’s flight didn’t land until the following afternoon, so the next morning we drove to downtown Banff and worked from a coffee shop before checking into the hotel. Banff is about half way between Golden and Calgary, so it was the perfect stopover before heading to the airport. To provide some background, Ching had decided to surprise DJ with a trip to visit us for his birthday. We’d splurged on accommodation to celebrate and Ching ended up booking the swanky Rim Rock Hotel for the weekend. When Derrick and I checked in that afternoon, we’d been camping for a week and were probably the dirtiest bunch of hippies they’d ever let stay there. Oops! A shower was the first item on the agenda. We quickly cleaned up for our guests of honor and finally headed to Calgary to pick them up that evening. Unfortunately, throughout our drive east, the wildfire smoke continued to worsen and by the time we picked up DJ and Ching it was as thick as pea soup. Calgary looked apocalyptic with a fiery red sun and smoke as far as you could see (which wasn’t very far). This also meant very little views of the mountains as we got closer to Banff, so we entertained ourselves with catch-up conversation from the month we’d spent apart. When we arrived in Banff, we had a late-night dinner at Park Distillery before heading to the hotel to surprise DJ with the swanky accommodations. Ching knew she couldn’t keep their destination a secret forever so she hid the hotel details from him which allowed her and I to convince him we were staying at the Super 8. Only the best for DJ! I think he would’ve been fine with the Super 8 or similar, but the Rim Rock was certainly a bonus! 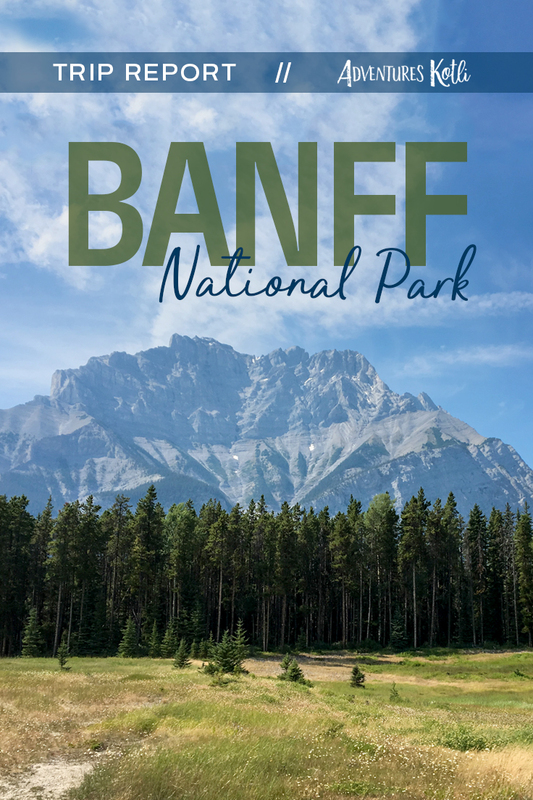 Just to clear this up, “Banff” is a large town in Banff National Park. As Americans, we’ve been very confused by this throughout our Canadian National Park tour. Aside from a visitor’s center and some small restaurants and motels/campgrounds, you won’t find much development in an American National Park. However, in Canada, the national parks all seem to have at least 2-3 towns within their borders. Towns like Banff are even large enough for a variety of hotels (large and small), residences, a downtown area and more. We figure this is because their national parks are so large that you’d need to stay in the middle to even explore the full area, but we never truly figured out why. If you know, share in the comments! The next day we put our tourist pants on and headed to Lake Louise, arguably the most famous lake in Banff. The parking lot at the lake was already full when we arrived so we ended up parking in the overflow lot and taking the shuttle to the lake. Like our travel tips for Muir Woods (and most tourist attractions), plan to arrive early in the morning or late in the evening and avoid the weekends when possible. Luckily, we’d received some helpful beta from an ex-Banff local who told us to hike the tea house trails that begin at Lake Louise. We took some touristy pictures in front of the amazing blue water before immediately walking away from the crowds toward the other end of the lake. The trailhead to both the Agnes Tea House and the Plain of Six Glaciers Tea House start at the opposite end of the lake from the Fairmont Hotel (where the shuttles drop off). We chose to hike the Plain of Six Glaciers trail which we’d read was a bit more challenging and therefore inevitably less-traveled (there were a lot of people so I’m not sure how true that is). The hike was a workout but the views throughout were spectacular with towering glaciers ahead of you and the aqua-colored Lake Louise never too far behind. The tea houses were built in the early 1940’s as shelter for mountaineers. I don’t think they’ve changed much since they were originally built which left their old-world charm and character still intact. When we arrived at the tea house, there was a big crowd, however, we only waited a few minutes to get a table. We learned from the seasonal staff that they trek up to the tea house once a week and sleep on site for five days. Most of their provisions are flown in by helicopter at the start of the season and they pack in replenishments weekly. Sounds like one hell of a summer job to me. Even as hot as we were, the non-traditional lunch of tea, soup, and cheese sandwiches was delicious. If that’s not your cup of tea (pun intended, obviously) we saw plenty of people with bagged lunches that they enjoyed at the many resting sites around the tea house. At the end of the hike, we stopped at the shore of Lake Louise to dip our feet in the glacial water. It was a hot afternoon so the cold water felt good for a minute, but quickly numbed our feet if we stood in it too long! We even saw a (crazy) man swimming and covering himself in the rock powder that sits at the bottom of the lake. This "powder" is created by the movement of the glaciers over the rock beds and is what makes Lake Louise so vibrantly blue. When wet, it feels a lot like clay which gave our feet a natural pedicure, and the swimming man a natural spa bath. On the way back to our car, we realized the access road to Moraine Lake had been reopened (they close it when the parking fills as there are no shuttles available to this lake) so we detoured to check it out. Moraine Lake is another stunningly blue lake in Banff National Park, but it was a deeper blue than Lake Louise. 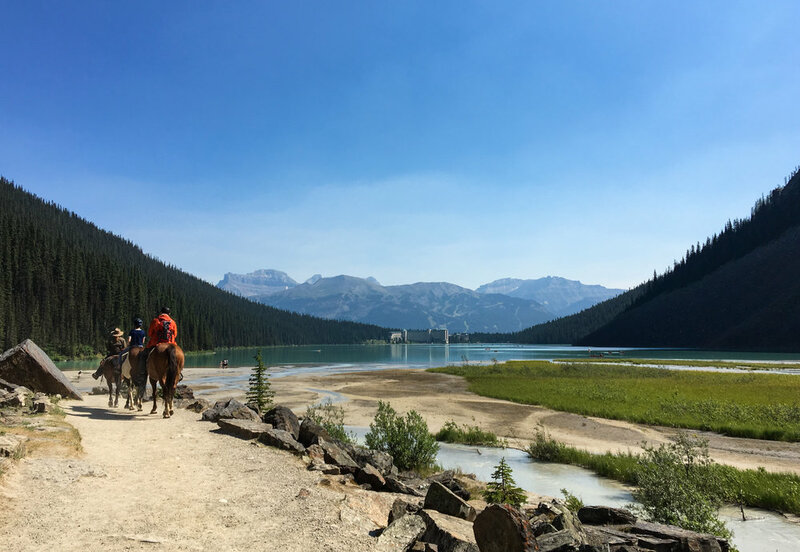 There’s plenty of hiking and water activities to enjoy here too, but we were all exhausted from the tea house hike and agreed a visit to the Banff Hot Springs sounded better. Unfortunately, the wildfire smoke had rolled in again while we were at Lake Louise and we ended up enjoying the outdoor hot spring with a side of falling ash. The wildfires weren’t even that close to Banff, but the winds were strong enough to blow plumes of smoke over the city and with them burnt pine needles and bark. Again, very apocalyptic. That night, we treated the birthday boy to some Mexican food at Magpie & Stump (it was originally a British pub that evolved into Mexican over time). We did a round of “Tequila Roulette” shots where one of the four shots featured a healthy dose of habanero in the tequila. After begging our server to make sure it wasn’t mine (because I’m a wuss) Derrick was the “unlucky” recipient but later complained that it wasn’t spicy enough. Go figure. We finished the night off with drinks at Wild Bill's Saloon where Ching sang-a-long to the country version of “Oh Canada” and Derrick gave her a second-wind by swing dancing her around the bar. I’d, unfortunately, rolled my ankle during our tea house hike and made it even worse by rolling it AGAIN in a pothole while walking to the bar. By the last call, it had swelled to the twice its size so we called it a night and went back to the hotel for some ice and room service. Our last day with DJ and Ching arrived far too quickly but their flight didn’t leave until 6:00 am on Monday morning, so we had all day and night to keep exploring. 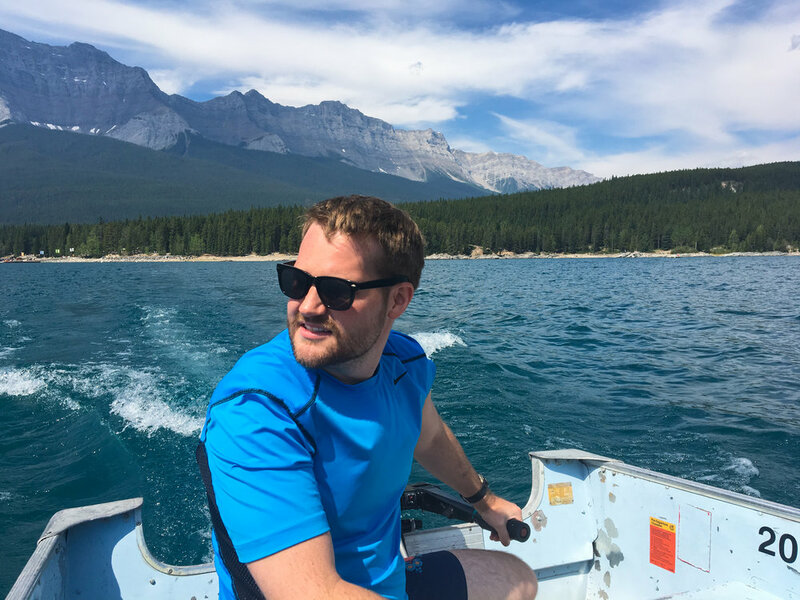 We stuck with the lake theme, partially due to a hangover and partially to my swollen ankle, and ended up renting a small dinghy to ride around on Lake Minnewanka. Only about 20 minutes outside of Banff, the drive to Lake Minnewanka is easy and the crowds were surprisingly thin. It’s yet another stunningly blue, crystal clear lake, and riding around on even a slow-moving dinghy was a blast. 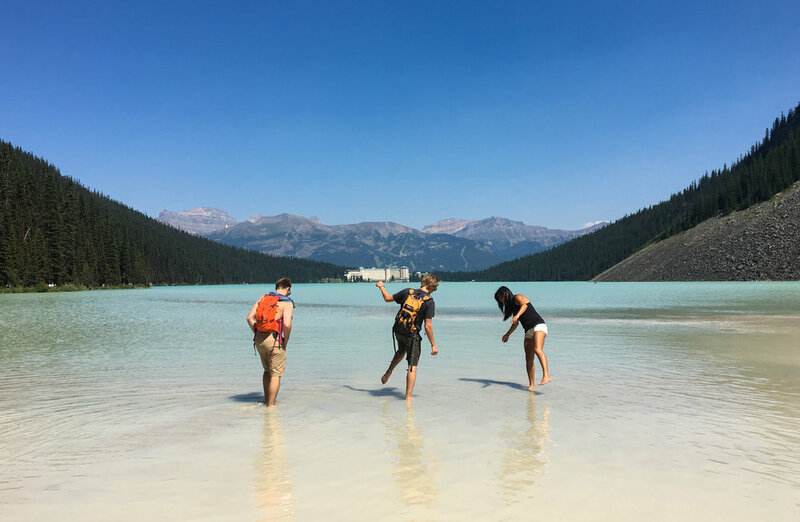 If you're in Banff and find yourself sick of the crowds, Lake Minnewanka is the perfect option for a day spent relaxing on the beach, cruising around the lake, or hiking the many trails in the area. We’d decided to stay in Calgary that night since their flight was so early the next morning, so after a picnic lunch on the shore, we hit downtown Banff for an hour of souvenir shopping before heading back to the city. Our AirBnb in Calgary was a luxury apartment in a sky rise downtown that overlooked the famous Calgary Stampede arena. While shopping in Banff, one of the locals had seen my Harry Potter earrings (I’m the biggest nerd around) and told me about the Harry Potter celebration in Calgary that day. Naturally, I made the group head in that direction and spent the night taking pictures of all the storefronts decked out with Harry Potter décor. We’d missed the main event but the remnants from the day were enough for this fanatic. 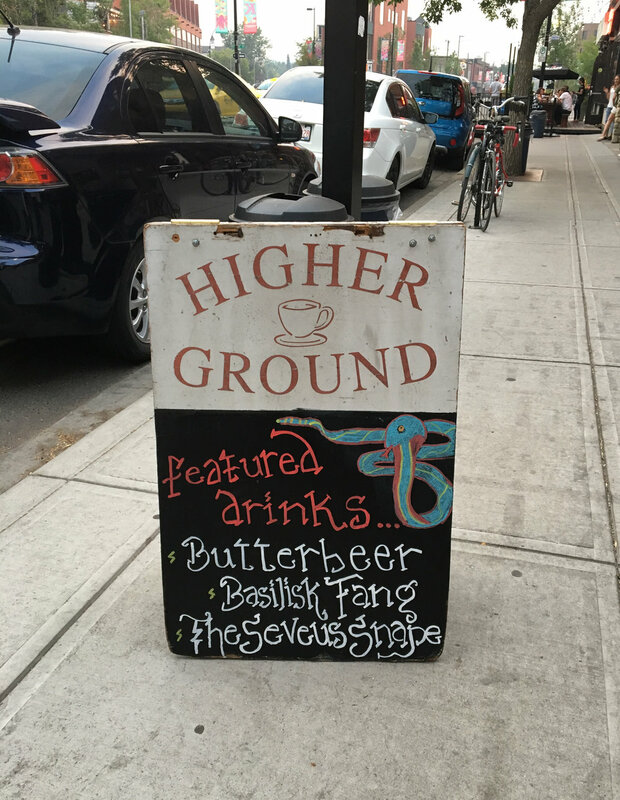 Apparently, in honor of Harry Potter's birthday (July 31 – again, huge nerd) Calgary turns a popular city borough into every Harry Potter fan’s dream and celebrates the franchise with themed drinks, menus, events, and activities. I even ordered a Gatorade and Chambord cocktail at dinner because the restaurant named it “The Hogwarts Express.” Did I regret it? Not in the least. If you’re a Harry Potter fan and have a desire to visit Calgary, July 31st is the day to go. Sadly, the next morning we said sleepy goodbyes to DJ and Ching and spent the full day working to pay off our “vacation” splurges from three days of eating, drinking, and adventuring around Banff. We had an absolute blast and hope they did as well. As always, the invite is open to anyone that wants to meet us on the road! We’d love to have you wherever we end up – Harry Potter activities not necessarily included. Like this post? Pin it to share with others!